Photo of the Shenzhou 8 spacecraft undergoing testing earlier in 2011. The failure of a Chinese Long March rocket last week will not affect the country's plans to launch a 19,000-pound space station module later this year, a senior Chinese space official told state media. The mishap occurred Thursday (Aug. 18) during the launch of an experimental Shijian 11 satellite aboard a 138-foot-tall Long March 2C rocket. It was the first problem during a Chinese space launch since 2008, when an Indonesian communications satellite was placed in an incorrect orbit. The launch was the third in one week for China's space program. The rapid launch rate was building up to a long-awaited mission carrying the Tiangong 1 module into orbit, the first step in China's ambition to construct a large space station by 2020. Qi Faren, chief designer for China's Shenzhou manned spacecraft, was quoted in the state-run Xinhua news agency as saying the Long March 2F rocket is different than the vehicle that failed Thursday. Tiangong 1 and its Long March 2F rocket are both at the Jiuquan space center in northwest China near the border between the provinces of Gansu and Inner Mongolia. 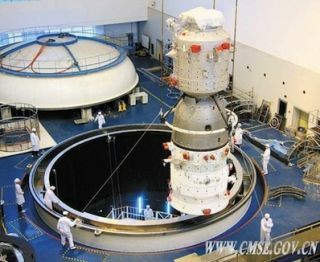 The spacecraft arrived at Jiuquan in June, followed by the delivery of the Long March booster in July. Some sources indicate Tiangong 1's launch could occur in the next few weeks. Photo of the Tiangong 1 module undergoing testing earlier in 2011. The Tiangong 1 module could be a prototype for subsequent space station modules or a robotic cargo freighter to resupply future Chinese orbital outposts. The spacecraft will be the target of the unmanned Shenzhou 8 capsule slated to launch approximately two months after Tiangong 1 gets to space. The Shenzhou craft will attempt to automatically rendezvous and dock with Tiangong 1, a significant achievement for China's burgeoning space program. China has mounted three manned space flights since 2003. The most recent voyage accomplished the first Chinese spacewalk in 2008. The Shijian 11 payload aboard Thursday's ill-fated launch was heading for a nearly 500-mile-high perch flying over Earth's poles, but the rocket did not achieve sufficient velocity to reach orbit. Leftover debris from the rocket and satellite likely fell back to Earth. The spacecraft lost Thursday was the fourth in the Shijian 11 series of satellites. Some analysts believe the Shijian 11 series is a fleet of early warning spacecraft for the Chinese military. Chinese officials say they are investigating the cause of the anomaly.